I have been saving this book for a long time. Everything I read indicated it would be a book I loved, a book I would want to read over and over. Many bloggers whose opinions I trust raved about it. So, as I do, it was set aside for just the right time. Last week I pulled it off my shelf and decided that time had come. I settled down prepared for a wonderful experience. I know, some of you are ready to click away right now so let me hasten to add that I didn't hate it. In many ways, I enjoyed it. It had lines and scenes that made me smile and laugh. But it also had lines and scenes and characters that frustrated me intensely. Guard Your Daughters is the story of the Harvey family--five sisters, a father who is a famous author, and a fragile mother. They live a very isolated life with little contact with society around them. The oldest, Pandora, is married and has moved away but the others still live a very circumscribed life. The first paragraph of the book makes this clear. I'm very fond of my new friends, but I do get angry when they tell me how dull my life must have been before I came to London. We were queer, I suppose, and restricted, and we used to fret and grumble, but the one thing our sort of family doesn't suffer from is boredom. The reader realizes quickly that there is more going on than just a slightly odd, introverted family and that much of this is because of the mother. The family does all they can to shelter and protect her and they react very strongly to any threat to her peace of mind. In turn, she reacts unreasonably to any opposition. Her oldest daughter, Pandora, suggests that the youngest might benefit from going to school but notice the way the mother responds. Mother was breathing quickly. She looked at Pandora with naked hostility. Neither of them took any notice of me. Mother said: "I have borne five children, Pandora, and by this time I know how to take care of them. No one else knows that as well as I do. But call Teresa, if you wish. Ask her what she would like to do. If she says she wants to go to school, I will let her go, even if it should"--she dropped her voice almost to a whisper--"break me." From then on, the book feels a bit as if it is hurtling toward an inevitable crash. Unfortunately, I never really cared enough about any of the characters and sometimes I actively disliked them and their actions. Throughout the book, you are held at a distance. The characters, the girls, all seem a bit formulaic; each with their identifying talent that somehow does not prevent them from running together as a group. They were brittle and self-absorbed. At one point, a girl visits whom they do not know well. To entertain her we made conversation amongst ourselves and she listened, looking slightly astonished, while we interrupted and contradicted each other and shouted each other down with bursts of laughter. Now and then we would pause to give her a chance and she would drop a cliche plop into the seething conversation, which at once died down and only started to bubble again after a struggle. Our common attempt to get to know each other was thus, on the whole, unsuccessful, and we were all glad when Patrick and Teresa brought in the tea and piping scones. That poor girl. Can you imagine the conversation? I know many compare this to I Capture the Castle but other than the obvious surface similarities I don't think that holds up. I Capture the Castle pulls you in from the first sentence--"I write this sitting in the kitchen sink"--and from that first moment the reader is part of the Mortmain family. The reader is right there with Cassandra as she writes. 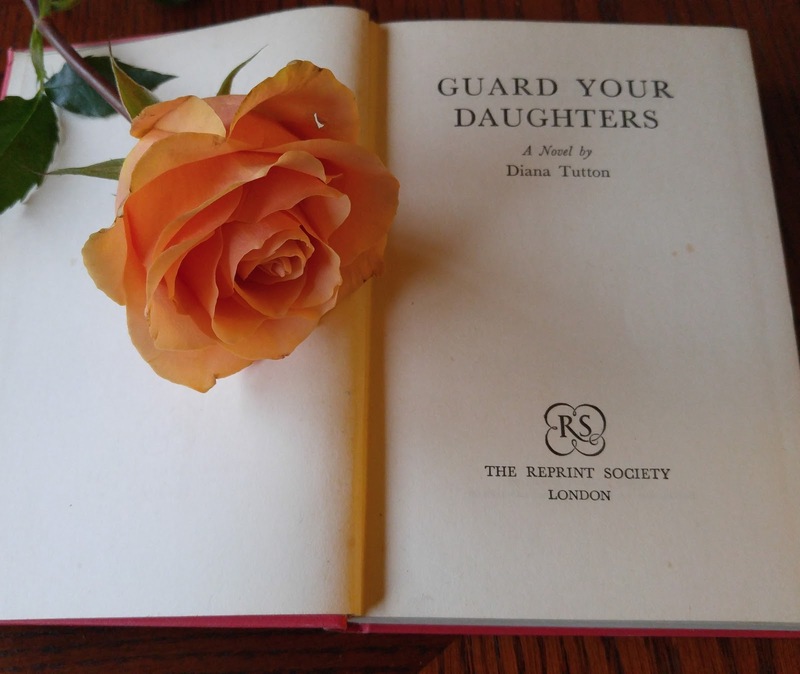 Guard Your Daughters leaves the reader on the outside looking in at a fragile construct that will fall apart at any moment. Was Diana Tutton trying to write a feel-good novel about a family? Probably not, in my opinion. Was she writing about the long-term effect of dysfunction on a family? Possibly. Either way, this book left me disturbed and slightly irritated. I felt it could have been so much more than it was. Welcome to the most exclusive club for book bloggers: the naysayers of Guard Your Daughters. I agree with everything you've said here and remain completely bewildered that other readers can find this book engaging, never mind charming. It is not a club I expected to belong to... I definitely did not find the book charming. Disturbing would be a more accurate word choice. It took me a while to write the review because it was so completely different from what I was expecting. I totally agree with you. I read the novel a long time ago, and found it rather disturbing. The girls are told that their mentally fragile mother must not be upset, so she ends up as a controlling tyrant, who tries to deny her daughters any social life. Whilst there are occasional amusing moments, I find it strange that some people have described it as a comedy. She is a controlling tyrant, isn't she? That is so disturbing. There were moments I liked, a line that made me smile or a description that struck home, but it really was not a book I loved. The further I get from my reading of it the more I am not sure I liked it at all. BUT I know how frustrating it is when people say you're going to love a book, and you expect to love it, and then you don't. So hard. I sympathize. This really caught me off guard because it was reviewed by a whole bunch of bloggers I read and they all seemed to love it. I was so sure I would love it too. Oh well, we can't all like the same things. I think that can create unreasonable expectations. I enjoyed I Capture the Castle and have even re-read it but I wonder what my reaction would be if I read it for the first time after discovering book blogs and reading lots of reviews of it. It is interesting to think about how much the conversations we read about a book can influence our reaction to it. I did like this book, though I hardly remember details now. But I do sympathize: so disappointing when a book you're really looking forward to is a bust. For me, that was The Essex Serpent. I read about it in the UK press and British book blogs and could hardly wait for its US publication, and then finally, meh. I have wondered about The Essex Serpent. So many people gave it rave reviews. It is so disappointing when a book doesn't live up to expectations. I've read mixed reviews of this novel. Shame, if it's being promoted as another I Capture the Castle which is a hard act to follow. I enjoyed reading your review, though!